All transactions are safe and secure with a reliable history in online purchasing behind each of our associates. 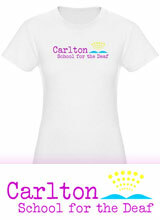 Buy the Carlton School for the Deaf t-shirt to own Switched at Birth clothing and merchandise. When it comes to schooling, Bay and Daphne have had very different experiences in life, but when they come together their educations become intermingled. The prestigious Buckner Hall is Bay and Toby's alma mater until Daphne begins taking cooking classes there in the afternoons. That isn't the only change. As Bay better understands ASL and begins to further herself from her current life, she enrolls in a pilot program for the hearing at Daphne's school. Promote this innovative show in a Carlton School for the Deaf t-shirt. In addition to the Carlton School for the Deaf tee above, browse the Switched at Birth Clothing Gallery for more apparel like men's and women's clothes, kids shirts or hoodies.